I needed to get a card out in the mail today with only a 10 minute notice. She wanted a Action Wobble on it. So here it is. I'm not real impressed but for a 10 minute card it will have to do. Such a great card - so cute and adorable. I think it's just adorable, the image is just darling! OMG Love Love this. That little nurse is so adorable. Thank you for joining us over at Action Wobbles. This is so super adorable!! I love those action wobbles!! TFS and hope you had a GREAT day!! That nurse is adorable!!! Great card. What a darling card---that little elephant is just too cute! Looks great for a 10 minute card! Adorable image! Sure to cheer anyone up! I think its adorable. It takes me 20 minutes just to decide what paper to use LOL! Hi Nana! !Stop it! !You know that this is Stinkin Cute..Right?..LOL..cannot stop laughing..Its too cute!Adorable!Love it!Best EVER!!! May your day be filled with lots Sunshine!!! 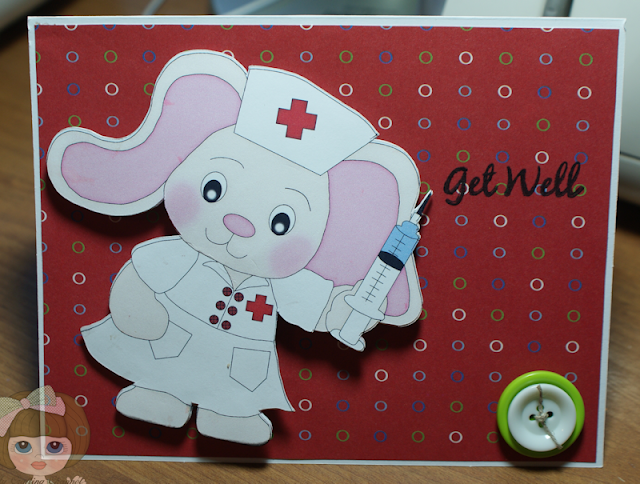 What a cute nurse and the card is just adorable. I love the paper choices. This will cheer any one up.